Bankruptcy is a time honored tradition that provides honest debtors the opportunity for a fresh start. Most people who file a bankruptcy have experienced financial problems beyond their control. Bankruptcies are filed through the federal court and are governed, for the most part, by the federal bankruptcy statutes and court rules. Chapter 7 bankruptcy is a straight liquidation and the simplest and quickest form of bankruptcy available. Under a Chapter 7 bankruptcy most debts are discharged. Under Chapter 7, a bankruptcy trustee will sell off a debtor’s non-exempt assets for the benefit of creditors. However, in over 90% of Chapter 7 cases, debtors are able to exempt and keep all of their assets including their home, vehicles, furniture and other possessions. Chapter 13 is a payback plan that lasts from 3 to 5 years. Chapter 13 is most often used to rescue a home from foreclosure when the debtors are behind on their house payments or they earn too much income to qualify for a Chapter 7 bankruptcy. How do I know if I am eligible to file bankruptcy? To be eligible for a Chapter 7 bankruptcy, you must not have received a bankruptcy discharge in the past eight years. You are also subject to “means testing”. Persons, whose income is greater than the median income for the local area, as established by the U.S. Census Bureau, may not be eligible to file Chapter 7. To be eligible for a Chapter 13 bankruptcy, you must have regular income, either through employment or self-employment, sufficiently stable and regular to allow you to make payments under a Chapter 13 plan. There are also limits to the amount of secured and unsecured debt that you may to be eligible for Chapter 13. For both Chapter 7 and Chapter 13 bankruptcy, debtors must complete credit counseling with an approved credit counseling agency before filing their petition and take a course in personal financial management from an approved provider before getting their discharge. Usually not. Certain property is exempt and may not be taken by creditors unless it is encumbered by a valid mortgage or lien. If you are able to keep making the mortgage or car payments, you are usually able to keep that property. Exempt property is property that is protected by law from the claims of creditors. Exempt property usually includes all or a portion of a person’s unpaid wages, social security benefits, home equity, household furniture and personal effects. Your attorney can inform you as to the property that is exempt in your case. What kinds of debt are dischargeable in bankruptcy? Credit card debt, medical debts, lines of credit and most personal debts are dischargeable. The types of debts that are not dischargeable or difficult to discharge include most taxes, student loans, alimony, child support, court fines, criminal restitution, and personal injury caused by drunk driving or under the influence of drugs. This is not a complete list of debts that are not dischargeable but includes the most common. 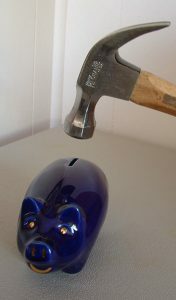 Will bankruptcy stop collections and garnishments? Once you file for bankruptcy, the “automatic stay” goes into effect immediately. The automatic stay suspends all collection and other legal proceedings against you, including garnishments. May employers discriminate against persons who have filed bankruptcy? It is illegal for either private or governmental employers to discriminate against a person that has filed for bankruptcy. It is also illegal for a local, state or federal governmental agency to discriminate against a person as to the granting of licenses, including drivers’ licenses. A bankruptcy may stay on our credit report for up to ten years. Often, over time, persons will see their credit score increase because their income to debt ratio is more favorable since their debts are discharged. Some financial institutions openly solicit business from persons who have recently received a bankruptcy discharge because it will be at least eight years before they can file bankruptcy again.